A golf school with custom club fitting - Matt Swanson's School of Golf has grown to be a state-of-the-art teaching facility and the top club fitting facility in Houston, with golf schools that can help imporve all aspects of the game to corporate events and an expanding junior program. Matt Swanson’s School of Golf and Custom Fitting Centers had developed a reputation for top quality instruction, exceptional instructors and cutting edge club fittings. Swanny’s Bar & Grill is open seven days a week for lunch and dinner, and Saturday and Sunday for breakfast. We serve great hamburgers, salads, wraps and appetizers, and more. We have seating on the covered, patio, a meeting room, indoor seating and a private banquet room. 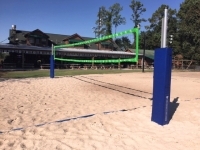 We have two sand volleyball courts and a large sports field, a stocked fishing pond, ping pong, a playground with covered sand box, big screen TV's the lenght of the patio and inside and a full patio bar. We cater and host events for all occasions!